It's that time again, Book of the Month time at Fat Quarter Shop! 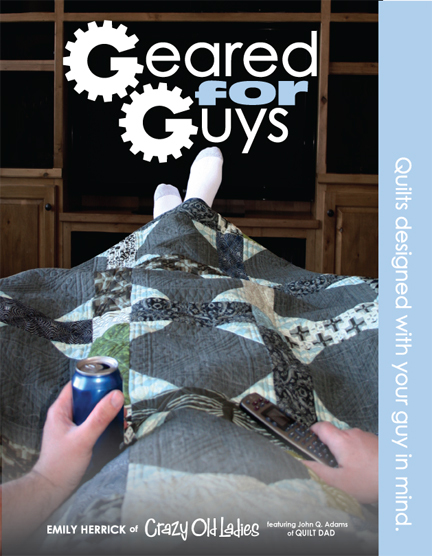 For the month of June, and in honor of Father's Day coming up, we are featuring Emily Herrick's Geared for Guys Quilt Book. Emily is here today to take us on a little walk-through on how her book is geared for guys. If I could do a cartwheel, I would be doing one right now! I am that excited that Fat Quarter Shop has chosen my book, Geared for Guys, as their June book of the month! Thanks Kimberly and crew for giving me the chance to tell you a bit about it. I’ll start by giving you a little background about me. 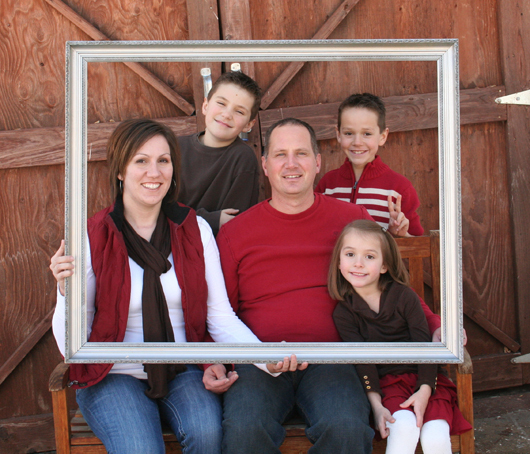 I am wife to one of the most patient men in the whole wide world, and mother to 3 terrific and rowdy kids (12, 10 and 7). We live in the beautiful state of Utah. Two and a half years ago I was diagnosed with thyroid cancer. Although not life threatening, there was still a myriad of hospital visits, surgeries, treatments, and changes to my everyday life. During that time I designed my first fabric collection. I joined the team at Michael Miller fabrics as a licensed fabric designer and released my first collection "Going Coastal" in the spring of 2011. Since that time I released "Hall of Fame" last fall, and my latest creation "Shore Thing" will be in shops this summer. I am so blessed and have to keep pinching myself that I am where I am today. But you’re here to hear about my book- so let’s get to it! At one time or another we have all thought of making a quilt for one of our guys. We head over to the local quilt shop and we have one of 3 choices in fabric. No, not 3 collections- 3 bolts. "Contrary to popular belief, most men do not hunt down a 12-point buck in the morning, grab a wrench and tune up their car in the afternoon, and then settle down with a cold frothy mug of beer in the evening while they grill the striped bass they caught on their fishing trip last week." Let’s face it, these categories work for a select few, but many of the guys I know want something 'cooler' than the latest novelty fabric categorized as "manly". 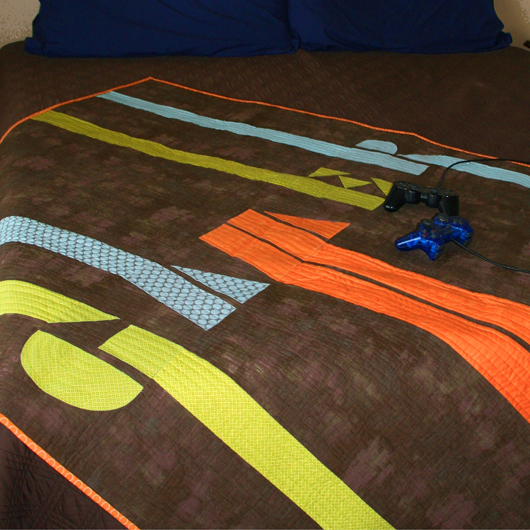 I want my guy's quilt to be one that he loves to use, not a quilt that he is embarrassed to curl up in. "Helix" is one of my favorites. 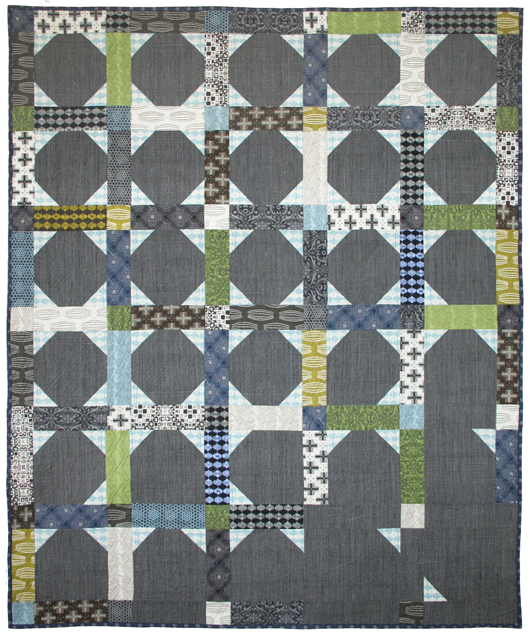 Can you believe that this quilt has fabric in it with prints that closely resemble flowers? Shhhh... don’t tell your guy. He would never know because the overall pattern is so striking and all he sees is the contrast in color. I also love "Urban Decay" designed by John Adams. 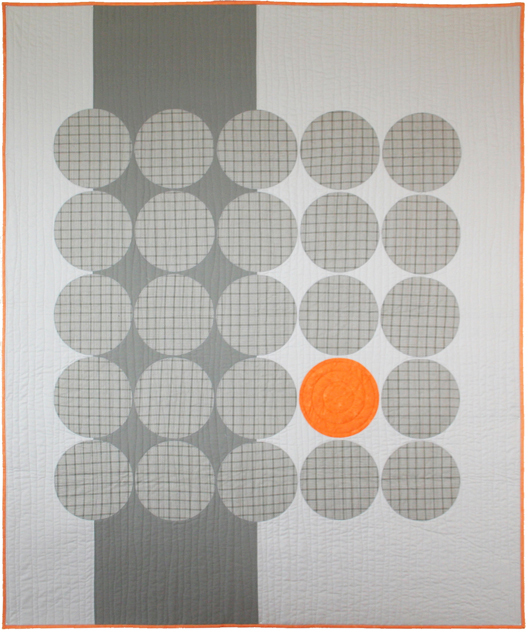 He took a traditional quilt block and threw it a curve ball with his twist on modern design. My goal was to design this book with 'YOUR' guy in mind. There are eight new quilt patterns to choose from, each with their own unique character and style. However, I really don't know your guy. But you do. For this reason I also include four teaching sections to help you when making a quilt for your guy. The same rules that we follow when making quilts for ourselves don't apply in the same way when making a quilt for a guy. My thoughts on choosing colors, finding fabrics, design elements and quilting style will help take out the guess work when you start on that quilt for your man. My boys are 10 and 12. They are done with cute boy fabrics and ready to be teenagers. 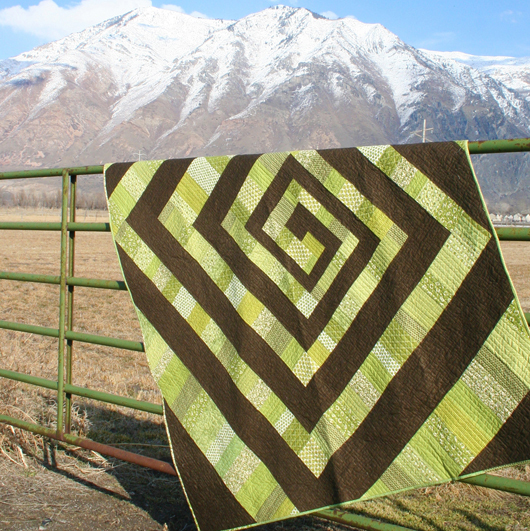 When it came to making them quilts I was completely stuck. I used the principles outlined in my teaching sections to come up with their quilts (both featured as patterns). The older of the two is my video-game fanatic and the reason I designed "Gamer". It has elements of design that speak his language without being juvenile. The 10 year old is a die-hard basketball player. The design elements and color choices (but not the name) in “OddBall” were chosen with him in mind. Even if he grows tired of basketball, he will never grow out of this quilt.